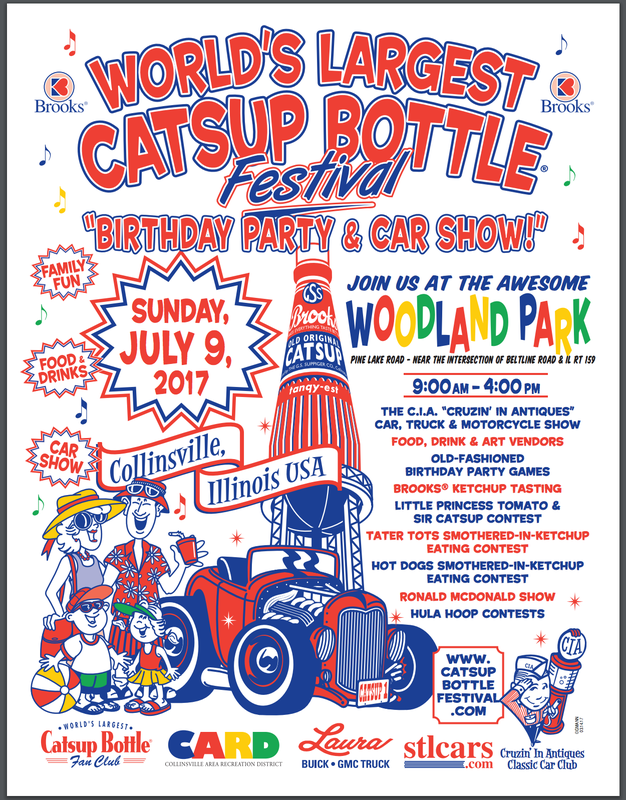 Today we indulged my love of small town festivals at Collinsville, Illinois' 19th Annual Brooks® World's Largest Catsup Bottle Festival Birthday Party & Car Show. What a descriptive name you have there. Collinsville used to have a Brooks ketchup (the catsup spelling is for heathens) factory that had a giant ketchup bottle shaped water tower. Well the factory moved to Canada (they took our jobs!) but America got to keep the sweet, sweet water tower. 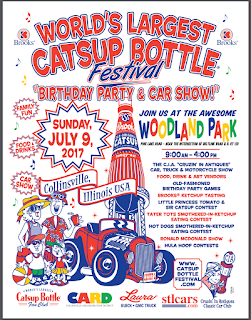 The festival honoring said water tower took place at Woodland Park which was also the location of the International Horseradish Festival. Collinsville truly is a city of wonders. One the most unique things they had going on was a ketchup tasting booth. If you could guess which one was Brooks brand you got a prize. Having never had it before I failed. Mom pulled out a win though and got this sweet button/ribbon combo. Fun ketchup fact: ketchup is a descendent of the Chinese fish sauce kôe-chiap or kê-chiap. It being a loan word that can't really be perfectly converted is the reason there are a few spelling variations. A couple of ketchup-haired ladies caught my eye. Gonna need a picture with them!